Same boat as the guy above, just started playing with my son and after a bit of searching as I could not remember the name, I was stoked to see it still being updated. Then even more stoked it is coming to the Microsoft version as well. Download Jolicraft 1.13 ~ AQUATIC UPDATE! That's right folks! At long last, JOLICRAFT is ready for the AQUATIC UPDATE! This is the most complete version of Jolicraft to date - I'm trying to leave no stone un-turned so please be sure to let me know if there's anything missing from the newest stuff (or any of the older stuff too!). Enjoy! Download Jolicraft 1.13 for the AQUATIC UPDATE! Wow your a legend! This pack is so amazing, thank you for the update! I'm absolutely in love with this pack, by far one of my favorites. The art direction is absolutely beautiful and the overall vibe of the pack is, well quite Joli! That being said I know there used to be a sort of "create your own" version of this pack. That's been long gone and I know it's incredibly difficult to maintain so I'm not looking for anything there. I was however wondering if there were any of those alternate textures lying around that I could somehow get a hold of, particularly for the cobblestone. I do enjoy the style of the current cobble but I have a few builds where a more traditional look may fit a bit better. Any help on this would be much appreciated. Regardless, amazing textures as always. Cheers. I've had an idea to add the alts to the default pack. With the new way Minecraft handles the textures it would be easy for me to add the alternate versions that folks could choose instead of the defaults. I'm going to consider that for the upcoming releases. 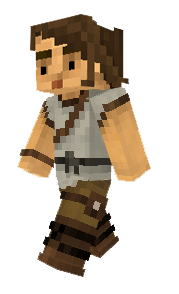 FYI, I just updated the pack with the new ALEX SKIN! Check it out! Quick update - I just added a new more official-ish logo to the main title screen. And a few other small tweaks. There was a time (maybe 1.10?) when I literally stopped playing Minecraft because you hadn't updated this pack for a while. I'm so glad you continue to provide updates. It's an amazing texture pack. 1) Smooth Quartz and Block of Quartz have the same texture, which is how the default texture pack is as well. 2) Glazed Terracotta have all the same appearance with different colors. Probably a design choice but I'd like to see what you'd come up with if you had to do a different style for each color (like the way the default texture pack does). My favourite new texture is the Heart of the Sea. I just smiled as soon as I saw it. Happy you're enjoying the updates! My goal moving forward is to keep it updated almost instantly with every major release. 1. Yup, no control over that, Minecraft uses the same texture for both. 2. I'd love to do that. Working through a big to-do list of other improvements (along with my super secret Jolicraft project coming VERY SOON). I'll add this to the list! Oh my god, Jolicraft returns! I remember using this when I first downloaded Minecraft and I was so sad to see the project disappear for the past few updates- thank you so much for creating the updated version of the pack, it's a huge surge of nostalgia for me! My pleasure, thanks for coming back! Thanks so much for updating this!!! I don't know if my settings are off but the leaf textures are totally opaque for me, even the gaps in between. I'm just curious if this is cause of the new graphics system in game?